I love this time of year! If you were on the ball you might already be harvesting goodies from your garden! In our neck of the woods, cherries are almost ready and we are on our second crop of yummy leafy greens like kale, lettuce and spinach. However, if you hate gardening or if you have a black thumb but still want to enjoy fresh, raw, nutrient dense greens in your diet you should try sprouting. It’s so simple and you only need a couple days before you can enjoy the harvest! Sprouts are a superfood for so many reasons. They are excellent sources of essential nutrients, high in protein, great sources of enzymes, easy to digest and good for weight loss. I usually sprout lentils, beans and fenugreek, but broccoli, radish and clover are also yummy options. Just be sure to avoid alfalfa as it is mildly toxic and also inhibits the immune system. 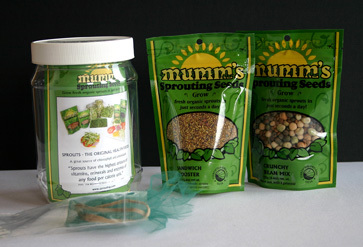 I usually get my sprouting seeds from Mumms. 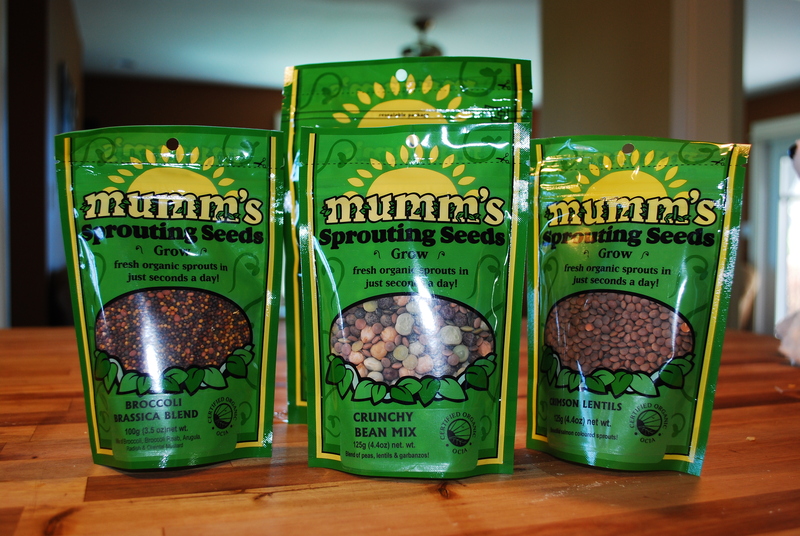 I love Mumms because they are a Canadian based business out of Saskatchewan and all their seeds are certified organic. Now to the good stuff….How to sprout. 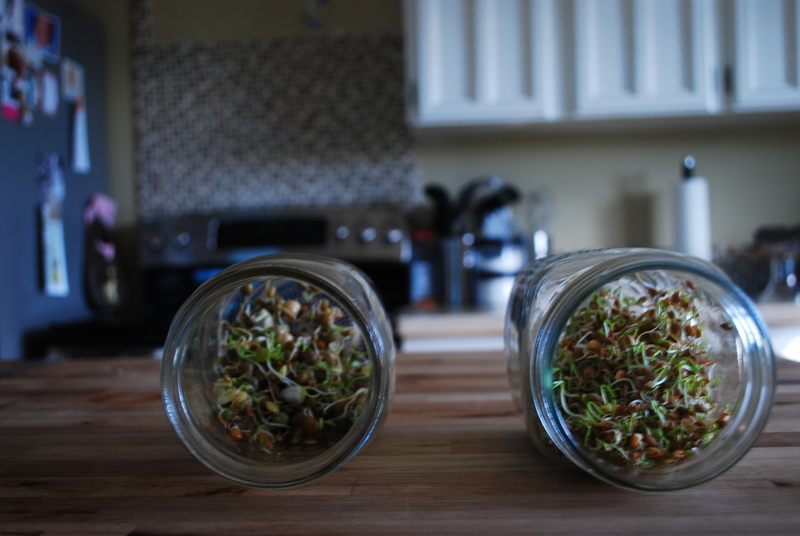 There are several ways to sprout seeds, but I will tell you how I do it. All you need is a mason jar. Dump about 2 Tbsp of seeds into the jar, add water, swirl and drain. Refill the jar with about a cup of water and soak your seeds for about 2-6 hrs. Drain the water. Rinse your seeds twice a day by refilling your jar with water. 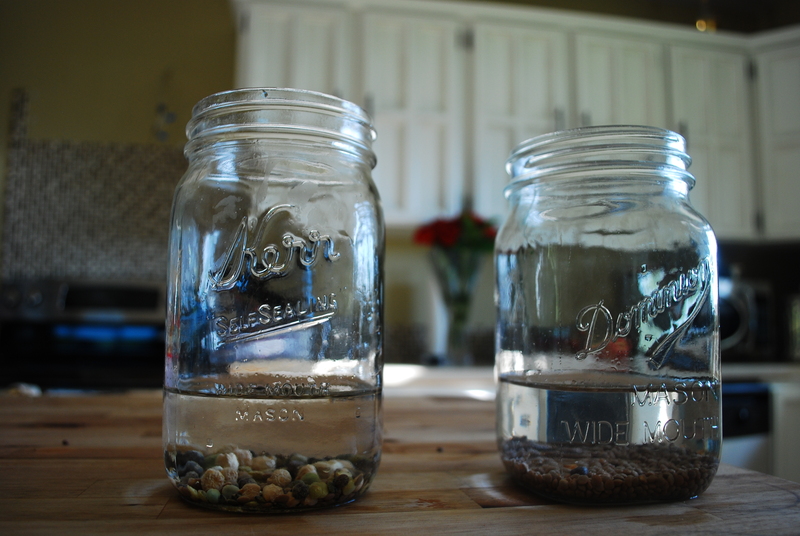 Drain the water and lay your jar on its side so that your seeds don’t mold in water. You could also cover your jar with mesh and keep your jar inverted to prevent mold from growing, this also makes the rinsing easier! You can eat your sprouts whenever you want. I like eating them with longer tails, but some people enjoy them sprouted with no tail. They are perfect in sandwiches, tossed in salads or you can just grab a handful and enjoy! So, who wants to add sprouts to their diet? If you do, just comment here and we will send one lucky reader the “Get sprouting jar” from Mumms. Share this post and let us know you did for an extra entry. Winner will be chosen June 19th. I’ve been itching to start some canning for awhile now. Last season I didn’t get much in. Between a kid under 1 and a husband who works out of town, there really wasn’t too much free time for canning. So, this is the perfect opportunity to get a little started! Strawberry jam, so delicious! So, here we go! 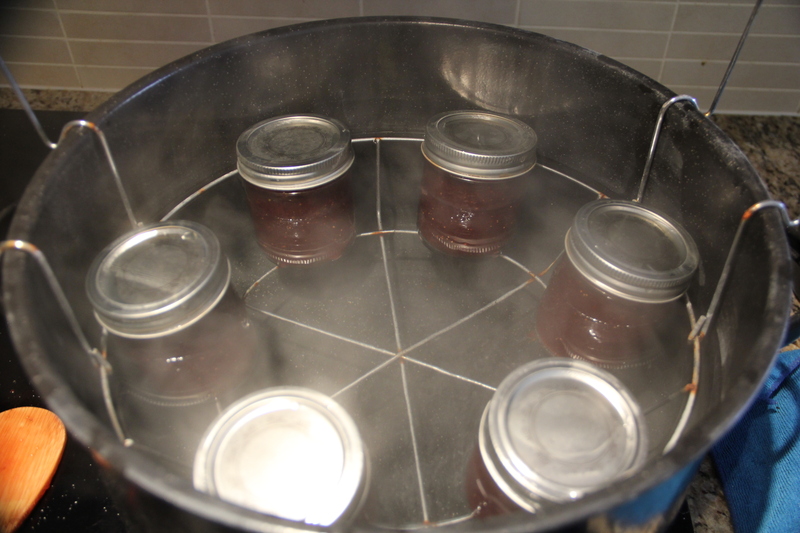 -For jam specifically, you need just the basic Water Bath Canner, which can be found at pretty much any big box store for a very decent price. -pectin. I use liquid pectin, but you can also get it in crystallized form as well. This is just a preference thing. 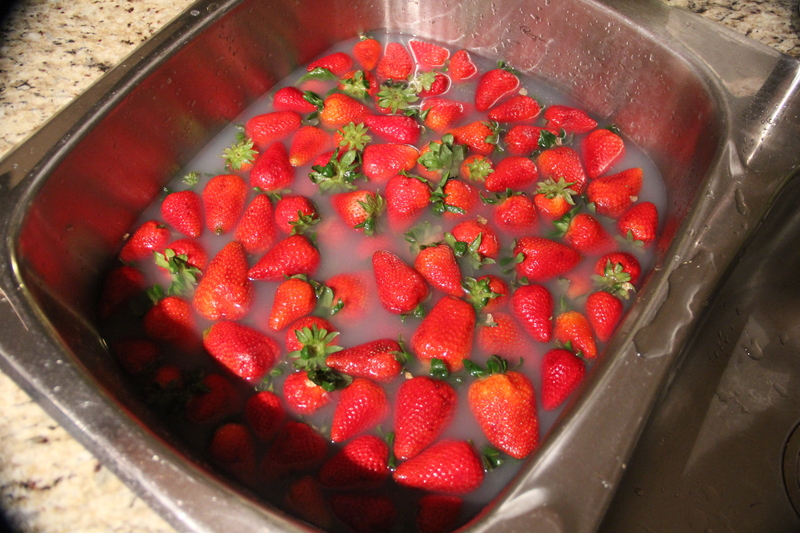 Before I made my jam, I washed the strawberries of course. I chose to soak them in a cool bath with castille soap first, to get any dirt, grime or pesticides off as best I could. I let them soak for about half and hour then, rinsed them off really well in cold water. This step may look a bit different for each person depending on how you like your jam. 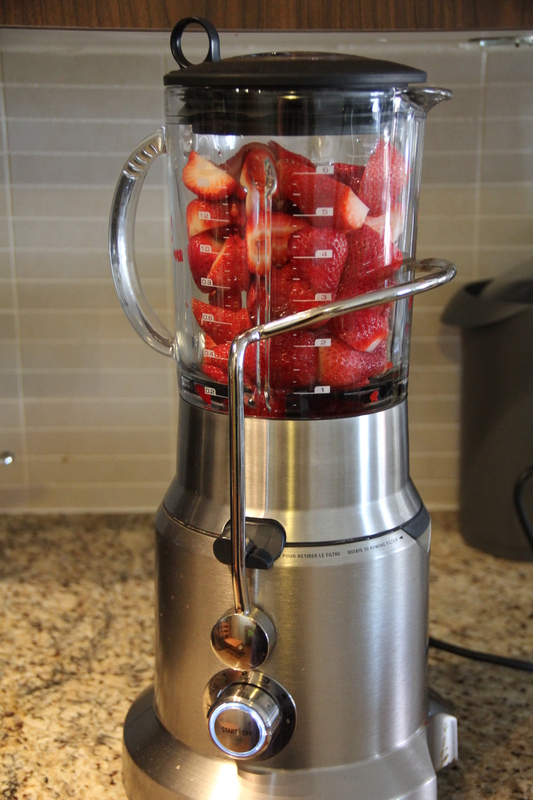 I don’t like chunkies in my jam so I chopped up my strawberries in a blender until there were no large chunks. It’s a good idea to add a little water to aid in the chopping process. You don’t have to puree them as they will dissolve more during the cooking process. If you don’t care about chunks, you can go ahead and just mash them up with a potato masher by hand. This shouldn’t take you very long. 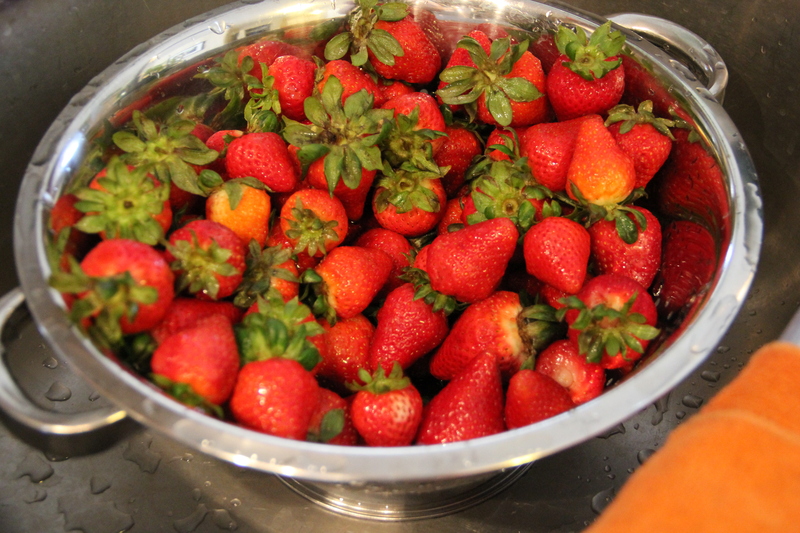 Add your mushed up strawberries to a pot with the sugar. Most recipes will have a 4 cups strawberries (measured after crushing) to 7 cups sugar ratio. I used 6 cups of strawberries (measured after crushing) so that’s 10 cups of sugar. I know! So much sugar. Welcome to the jam world! Strawberries especially require a lot of sugar. You can reduce the amount of sugar but you won’t get the same consistency. 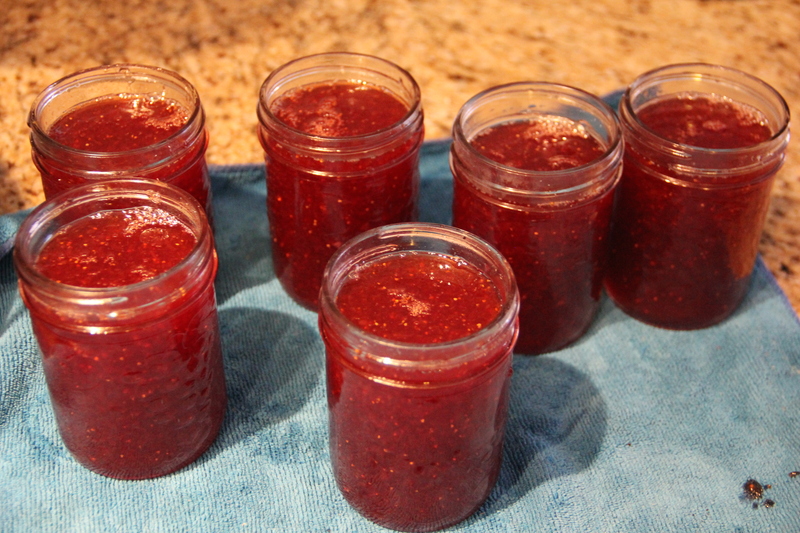 Even when using no sugar needed pectin (which I personally don’t like as I never find it makes very good jam). If you reduce the sugar you will usually yield a runnier jam. It will still be as tasty though! I usually do reduce my sugar to about 8 cups. The jam turns out soft but still thick and spreadable. *If you are new to jam making I would stick to the recommended amount of sugar. It can be difficult to get the correct consistency when you are playing around with the sugar levels and so I recommend having an idea as to what you’re trying to achieve before changing it. If you are using crystallized pectin, you need to reserve about 1/4 cup of the sugar to mix with it. I do recommend reading the instructions that came with your pectin, though. You will want to bring this mixture to a boil. Try doing it a little slower, this will generally result in a better jam. 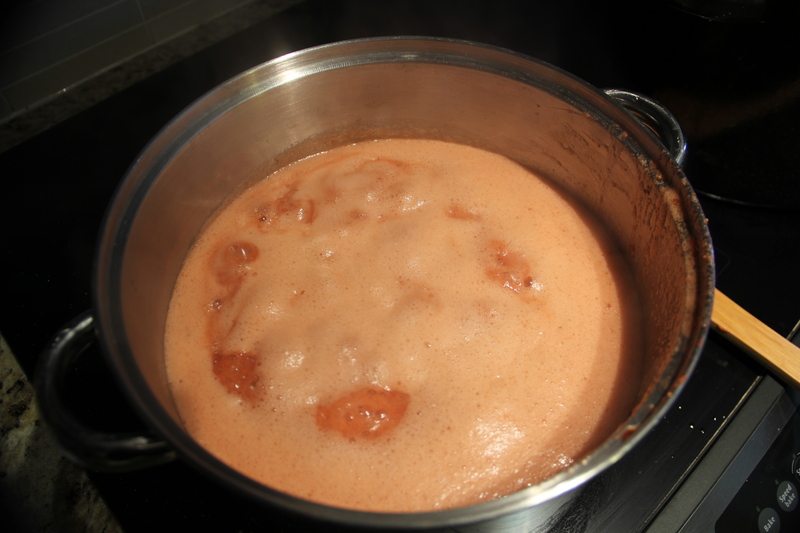 Once it is boiling, continue to let it boil for a few minutes, stirring occasionally. *I don’t recommend making batches bigger than this. Slowly add your pectin to the mixture. Return to a boil and keep there for about a minute or so. Remove from heat. Add about 1/4 cup lemon juice. Because I didn’t use as much sugar, I added 2 packets of liquid pectin to my recipe. (It is technically a double recipe according to their instructions anyways). 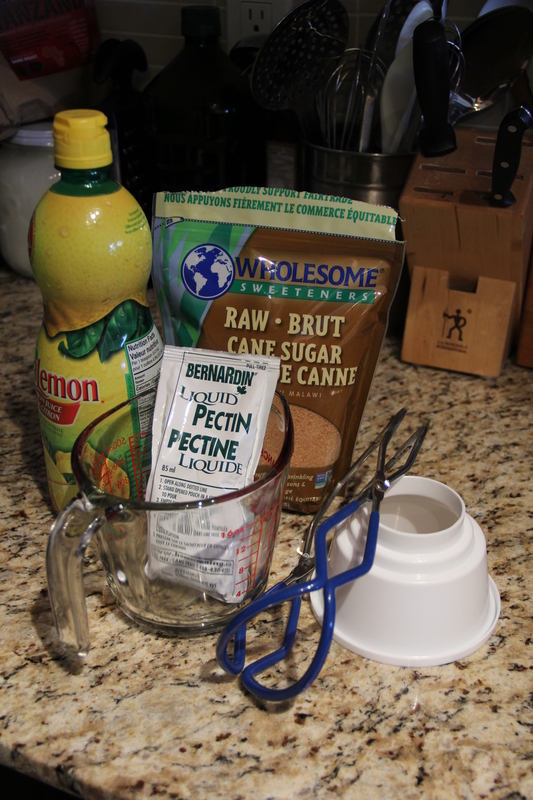 To figure out how much pectin you need is going to take a little experimentation on your part. It will really depend on how you like your jam. If you like it runnier, then you will need less pectin, thicker will need more pectin. I will tell you how to figure it out in the next step. Skim the foam off the top of the jam. This foam is nothing gross, don’t worry. It is pretty much just escaped air trapped in jam goo (great description!). Now, this is where I like to test if my jam is ready. 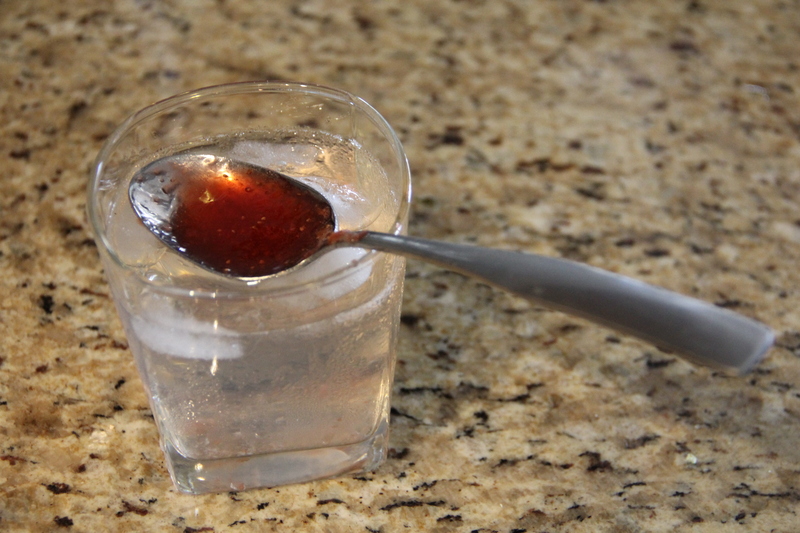 Take a glass of ice water and place a spoon in it. Once the spoon, is cold, scoop up a little jam and rest the spoon back on top of the ice. Once the jam has come down to room temperature, you can check it’s consistency. Touch it, tip the spoon around, etc. If it’s at a consistency you like, then perfect! You are ready for the next step. If not, return it to the stove and repeat step 4 but with about a quarter of a packet of pectin. Repeat the test. Continue doing this until you reach your desired consistency. Fill your jars with jam. Leave about a 1/4in headspace (unfilled area) at the top. Tighten caps to finger strength tight. You need them to be tight enough to not let water in, but to let air out. You should always wait until the water in your canner returns to a boil before starting the count. Remove jars from water bath and place in an area out of direct light. Let them seal and cool to room temperature before storing. You’re done! Yay! Jam can be enjoyed right away. No need to wait for this one! If any of your jars don’t seal, put them in the fridge and eat them immediately. 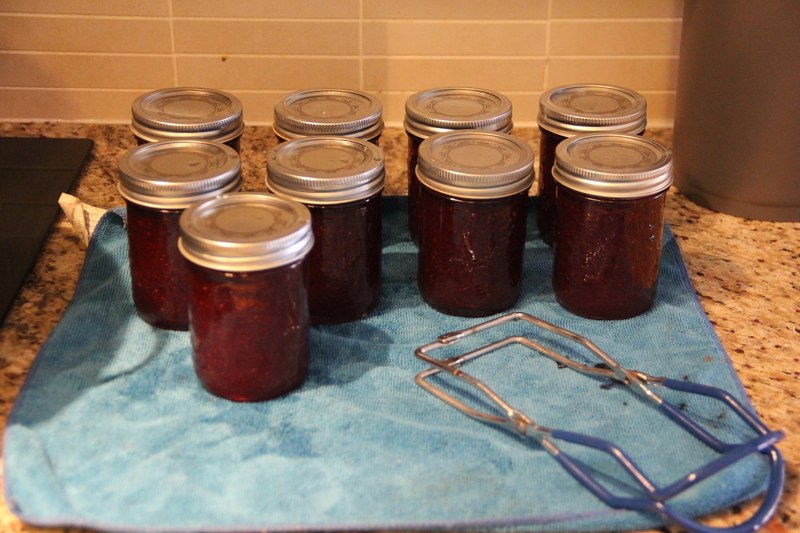 They will keep in the fridge as long as jam does, but they will not keep stored with your other canning. Colourful and Edible Finger Paint! Last year for Mother’s Day I wanted Miss A to do something special for my mum and mother-in-law.I’m always stumped for gifts for these two fabulous ladies, and I thought something that their granddaughter made would be perfect. Enter Pinterest. I saw this adorable idea and thought: “we can totally do this.” I bought a couple of photo frames from Wal Mart and took a photo of her painting and filled the top space with that and the bottom space with an actual painting that she created. It was such a big hit! Her grandmas loved them! Here’s a photo of our little doll enjoying herself! Note: I will admit that I sort of had to force her to “paint” on the paper, she was WAY more interested in tasting the paint. 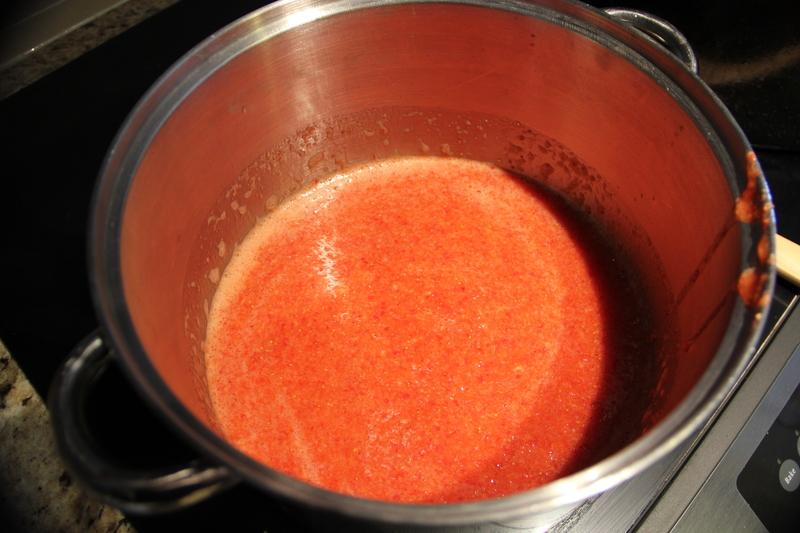 2) After the finger paint has thickened take the pan off the stove immediately, and let the mixture cool. I split the mixture in four plastic bowls to cool. 3) In each bowl, I used several drops of food colouring to create the colours that I wanted. This recipe makes a lot of paint, so you could make several colours. I just stuck to red, green, yellow and blue. I was so proud of myself and my homemade finger paint that I posted this photo on Facebook and I had over 30 people ask me for the recipe. A lot of the mamas asked me if the painted stained my little babe’s fingers. The answer is no; I didn’t have any trouble with staining, but it did get me thinking about natural food dyes and whether or not it was a good idea to let her eat it the stuff with food colouring in it. So, a few months later, we tried again, but this time, I avoided using food colouring and instead I made my own natural food colouring. Now, there are lots of different ways to make these colours, but, when you’re 8 months pregnant, trying to get settled and unpack a house while simultaneously trying to take care of a toddler and get ready for Christmas, easy is always better!! The colours weren’t as vibrant as when I used store-bought food colouring, but I felt a little bit better about letting her eat the stuff. We were also gifted a couple of colours of Maggie’s Natural Food Colouring, but at $12/colour, I didn’t want to use it on an art project. You can find Maggie’s Food Colouring at Raspberry Kids–one of my favourite Canadian owned Kid’s stores! Miss A wasn’t nearly as excited about the whole thing this time around (go figure). I had to force her to sit still and actually paint. She wanted to get up and run away with the paint bowls! Oh, and she didn’t even TRY to taste the stuff! Sigh…. Have any of you tried making finger paint? Do you have a fool-proof recipe to share? What about natural dyes? We’d love to hear your ideas!